French Stamps - Commemoratives of 1900 - What Happened ? 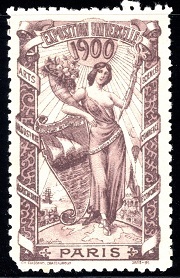 No commemorative or promotional French stamps were actually issued by the government of France during 1900. This is just incredible, considering that two extremely important international events were held in Paris during that year. Both events, the 1900 Universal Exposition of Paris and the 1900 Summer Olympic Games (Games of the Second Olympiad) had a number of organizational difficulties. The government revenue from sets of commemorative French postage stamps (and possibly commemorative coins) promoting each of these events could possibly have paid much of the cost of hosting them. 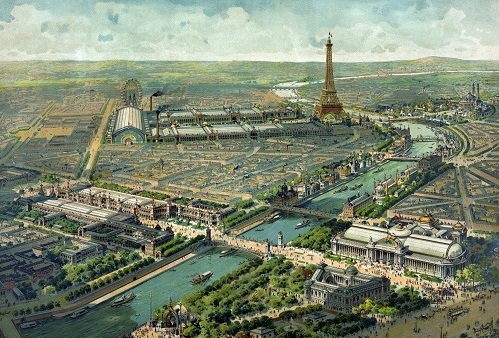 In the aftermath, the under-budgeted 1900 Universal Exposition of Paris became a huge financial loss to the organizers, and the five-month-long Games of the Second Olympiad became an odd side-show to the Universal Exposition, little noticed by much of the world. Of course, perforated and imperforate "French stamps" DO EXIST for both of these events. These "French stamps" are not inscribed "postage" (in French), they are not inscribed with a denomination, and they were not valid for postage on letter mail at the time. These types of stamps are known by philatelists as "poster stamps" or "Cinderella" stamps, with Cinderella implying that such stamps are the "poor stepchildren" of philately. These poster stamps were usually produced by private organizations and usually sold through promotional or fund-raising campaigns, as souvenirs at an event, or through philatelic channels. Actually, hundreds of these stamps were produced for the Paris Universal Exposition of 1900 with differing designs and in various colors. One attractive set I have seen features images of all the international pavilions at the exposition. Other sets show particular exposition events, allegorical subjects, or Olympic subjects, and in a lot of cases the sets exist in many different colors. 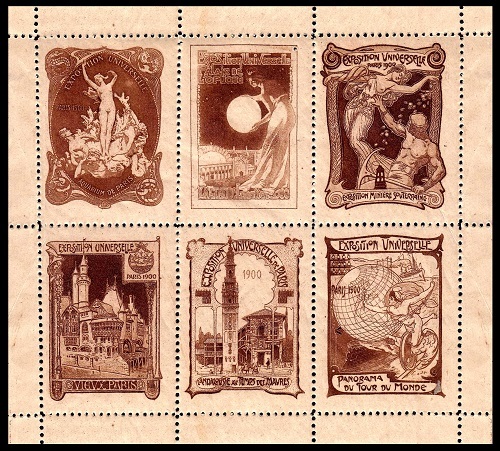 Here is a LINK to a website that contains many images of these 1900 Paris Universal Exposition poster stamps! In looking through the google images of these poster stamps, I also noted that many of the images were from eBay lots! So, if one wants to buy some of these stamps, eBay would be an excellent place to begin your search! There may not have been any actual commemorative French stamps produced in 1900, but these poster stamps of the time can make a very attractive ephemeral addition to any stamp collection, thematic collection, or philatelic exhibit. The Paris Universal Exposition, also known as the Paris Exposition, was a World's Fair held from April through November of 1900. Its purpose was to celebrate the achievements of the past century and the coming of the new century. The decorative style of the exhibition later became known as Art Nouveau. The exhibition featured machines, inventions, and architecture, including the Paris Ferris Wheel, diesel engines, talking films, escalators, and the first magnetic voice recorder. 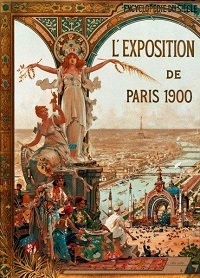 The exposition was attended by fifty million visitors. 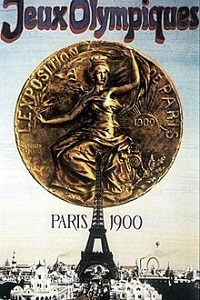 The 1900 Summer Olympic Games of Paris, officially, the Games of the Second Olympiad, were held as part of the Paris Universal Exposition of 1900. No opening or closing ceremonies were held. Almost a thousand athletes competed in nineteen sports between May 14 and October 28, 1900. Most of the winners in 1900 were given cups or trophies, instead of medals. Charlotte Cooper, a two-time Wimbledon champion, won the singles tennis championship, becoming the first individual female Olympic champion.